Miss P is ever so slowing inching her way into toddlerhood, :( boo, and it got me thinking about what my favorite baby items have been so far since it is time to start packing a lot of it away or getting rid of it. I decided to make a little round up of some of my favorite baby items and items that have worked GREAT for us. I got all of these images and links from the Babies R Us website but many of them are sold in other stores, in fact, I know I bought some of these in other stores. 1.) Boppy Newborn Lounger- I LOVE this thing!! It is great for placing that sleeping baby in or when they can't roll over quite yet and you need to run to the bathroom or get that load of laundry put into the dryer. We actually still put Miss P in this for her to drink her bottles. 2.) Skip Hop Moby Bathtub Elbow Rest- Makes bath time so much more comfortable! 3.) Babies R Us Bath Cozy- Perfect for keeping baby warm in the tub without having to use a washcloth. Covers baby completely so you can wash their hair or whatever without them getting cold. They have other cute ones as well. We also have a duck. 4.) Fisher Price Space Saver High Chair- This high chair is great! I was nervous it wouldn't push under our small kitchen table but it fits perfectly. We just take off the tray and place it behind the chair and it pushes right under. So nice not having a huge high chair taking up extra space in our kitchen since it sits on our current chairs. Plus, it leans back for smaller babies. I actually bought our print and style at Target. 5.) Wubbanub Pacifier- This thing is the BEST EVER!!!!!! I will buy every one of my friends having a baby a wubbanub for their shower! When baby spits out their pacifier is doesn't go flying or get lost under them. It just stays on their chest or next to them. And when they figure out how to put it back in their mouth, talk about glorious!! We have the dog, we call her Ruby, but there are a ton of other options out there. Babies R Us only carries 3 versions but you can get others on Amazon. 6.) Tommee Tippee Bottles- We decided to use Tommee Tippee bottles and I am really glad we did. They are great. P took to them very easily and she had no problem if I needed to give her a bottle when I was breast feeding her. They have regular bottles and bottles that help gas and colic in 2 different sizes. We have both. 7.) Johnson's Bedtime Bath and Lotion- This stuff works so well, for us at least! When I first started using it, I skipped a night or two accidentally and I totally noticed that P slept worse on the days I forgot to rub her down with lotion before bed. We put the lotion on her when we put her pj's on and then she normally drinks one last bottle and is ready to bed. 8.) Summer Infant Bath Chair- We have a small tub but I felt Miss P quickly outgrew it and it got difficult to bathe her so I found this chair and it was so much easier! There are 2 or 3 different positions depending on the baby's age and there are no sides restricting baby. Makes bath time so much faster and easier and much more comfortable for all! 9.) Ecergen Temporal Artery Thermomether- So great! All you have to do is hit the button and rub it across the baby's forehead, very similar to what they use in some doctor's offices. Reads in seconds. Perfect for a squirmy baby! Have you used any of these items? 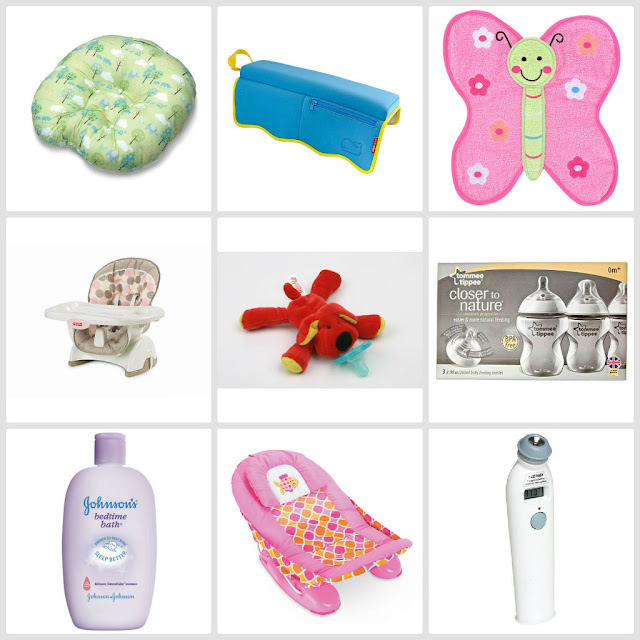 What is your favorite baby item? This post is just my opinion on these products because we have had a great experience while using them. I'm a new follower and let me tell you, I'm already in love with your blog, so consider me a blog stalker (: anyways, Thanks for your reviews on these items. I'm having my first baby in April and love LOVE love reading/getting baby advice. The Tommee Tippee bottles were on our list of things to get but we had never heard of anyone using them and instead went with Avent. Hopefully, they work well for us.